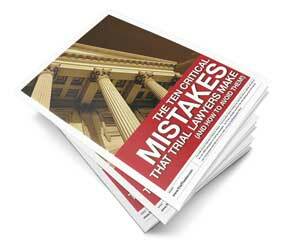 Three guidelines for maximizing the effectiveness of your stipulations during trial. The case was serious. The charge? Attempted Murder with a Firearm. The defendant was accused of shooting the victim in the head, and he was facing a potential sentence of life in prison. You would think that because its seriousness, my opponent and I would be fighting over every single issue in the case. But nothing could be further from the truth. Instead, we were standing in the hallway behind the courtroom, talking with the judge and telling him that we were stipulating to nearly every material fact in the case, that we were streamlining the introduction of exhibits, and that we’d agreed to significantly reduce the number of witnesses who would testify. Why would we do that? Why would two experienced attorneys (each hoping for a completely different outcome) agree to almost all of the issues in a case? We did it because we knew the strengths and weaknesses of our cases and were able to identify the true issues in the case. In short, we knew what mattered and what didn’t matter. Many attorneys don’t like to stipulate. They’re afraid that if they agree about anything with their opponent, they’ll seem weak. So instead, they argue about every issue with their opponent. Typically, the attorneys who are most afraid of stipulating are also the ones who either don’t understand their cases very well or don’t know how to try cases. But in my experience, the attorneys who stipulate are usually the best attorneys in the courthouse. They understand their cases inside and out, and know where to pick their battles. They streamline their cases, identifying the important issues, and agreeing to everything else. Permitting witnesses to give narrative responses so they can ?tell their story? 1. Don’t call them ?stipulations.? Are you confident that each of your jurors knows what ?stipulation? means? Don’t risk any confusion. Rather than titling the document ?Stipulations,? consider titling the document, ?Agreed Upon Facts,? ?Agreement Between the Parties,? or ?Facts No Longer in Dispute.? Also, consider writing an introductory paragraph like this: ?Both sides have agreed to the following facts. There’s no need for any further proof of these facts — they are no longer in dispute, and you may accept them as true.? 2. Get everyone to sign the document. Not just the lawyers — have all of the parties sign the document. That way, none of the jurors will get the mistaken impression that only the lawyers agreed to the stipulations. To really add some extra ?oomph? to the agreement, ask the judge to formalize the agreement by signing off on the document. To maximize the impact of your stipulations, you want to publish them at the most effective time. For example, let’s say that you and your opponent have both agreed that a firearm recovered from the house was loaded and operational. Rather than waiting until the end of your case to read that stipulation into evidence, you should publish it to the jury when the gun becomes important. After the witness testifies, ?I saw a gun next to the baby’s crib,? you can read the stipulation to the jury: ?Both parties have agreed that the firearm was loaded and fully operational.? Doesn’t it make more sense to publish it then, rather than waiting until the end of the trial when the jurors have forgotten about the gun? Consider making stipulations an integral part of your trial practice. The sooner you understand why to stipulate to issues in your case, the faster you will develop your trial skills. The better you understand your case, the more you’ll stipulate to. The more you stipulate to, the more focused your case will become. The more focused your case becomes, the better you’ll try your case. Keep it up, and before long, you’ll be one of the best trial lawyers in your courthouse!